Neighboring farmers in Iowa don’t like it, but some of the protesters who tried to block the final construction of the Dakota Access Pipeline in North Dakota have created a new settlement. 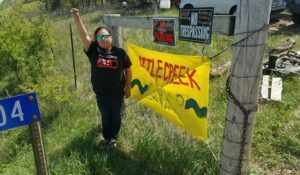 They moved onto a 14-acre site near Williamsburg, Iowa to create a permanent pipeline protest encampment they call the Little Creek Camp. It is a collection of tents and teepees and according to founder Christine Nobiss of the Indigenous Iowa blog, is dedicated to keeping the spirit of Standing Rock alive. She called her camp a “think tank” in an interview with the Washington Times. “This camp is long-term in terms of building an eco-village, a sustainable community. We’re here to help local farmers fight Monsanto,” she said. That’s where the rub is. Neighbors don’t like it but can’t do much about it because the property owner lives elsewhere and agreed to allow Nobiss to set up the Little Creek camp which houses as many as 20 activists. Lance Schaefer is one local farmer who doesn’t like what’s happened.